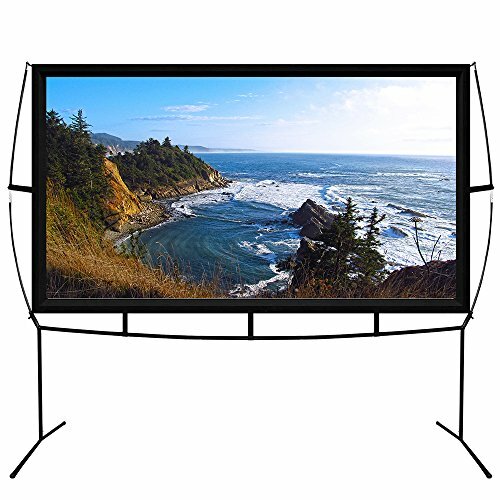 Portable projector screen is an affordable solution for professional or personal projection needs. Our easy-to-use screen is perfect for home theaters, businesses, and outdoo ractivities. The durable material offers smooth transitioning into desired screen height. Aluminum standing legs provide a stable base during use, and will fold up for easy portability (screen/tripod is 31 inches long when folded). It is universally suitable for most LED, LCD or DLP projectors on the market. All screens are made with a high-quality material for a clear image. Each screen is cleanable with mild soap and water. EASY TO SET UP - less than 10 minutes to set up the entire assembly. CONVENIENT TO CARRY -- Fold into a really small size, suit for outdoor activities. OUTDOOR MOVIE THEATER bring your family together with some popcorn for a night of family fun in the backyard, camping, tailgating, or a fun Summer party,. If you have any questions about this product by Blina, contact us by completing and submitting the form below. If you are looking for a specif part number, please include it with your message.